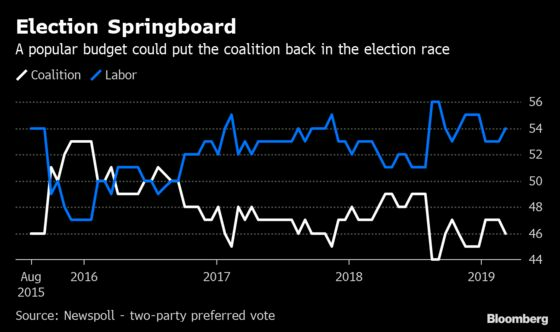 (Bloomberg) -- With elections due next month, Australia’s government announced a cash splash of tax cuts and funding for roads, rail and airports in a budget aimed at boosting its chances of winning a third term in office. At the same time, Treasurer Josh Frydenberg pledged to continue a crackdown on tax-evasion by multinational companies. Here are the winners and losers. The centerpiece of the budget is a pledge to deliver A$158 billion of tax relief for more than 10 million Australians. From July 1, low- and middle-income earners will get a lump sum of up to A$1,080 a year, or A$2,160 for dual-income families. In addition, the government is amending tax brackets, and will lower the 32.5 percent rate to 30 percent from 2024-25. 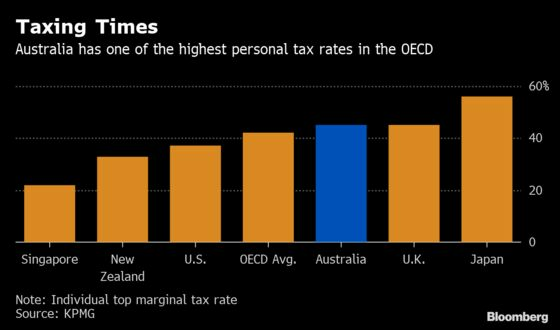 Still, with the top personal rate of 45 percent kicking in after A$200,000 from July 2024, Australians will still pay one of the highest rates in the OECD. The government has already legislated lower tax rates for companies with turnovers below A$50 million, and by 2021-22 they will pay 25 percent. It’s expanding an instant tax write-off for new equipment worth up to A$30,000 -- helping a café invest in a new fridge, for example, or a courier buy a new van. In a bid to ease congestion in cities such as Sydney and Melbourne, and improve access to regional Australia, the government announced A$100 billion in infrastructure spending over 10 years. Initiatives include A$2 billion for a fast-rail link between Melbourne and the southern coastal city of Geelong; A$100 million for regional airports; and better freight rail links for the island state of Tasmania. The Liberal-National coalition has been trailing the main opposition Labor party for months in opinion polls, which point to Morrison losing his job in next month’s elections. The tax cuts delivered in the budget could give Morrison the poll boost he needs to put him back in the election race. But with Labor expected to back the proposed relief for low- and middle-income earners, the government may find it hard to extract a budget bounce. Under a A$525 million skills package, 80,000 new apprenticeships will be created in industries with a skills shortage, with firms paid A$8,000 per placement. About 350,000 children will get access to 15 hours of early learning a week in the year before school. Australia is continuing its campaign to ensure big, global companies pay their fair share of tax. Thanks to new laws, the government has raised more than A$12 billion by taxing multinationals and wealthy individuals since 2016. The government is extending funding for a tax avoidance taskforce until June 2023 to continue the effort. From July 1, the government will make it harder for businesses to pay cash wages and will require firms tendering for large public contracts to have a good tax record. Frydenberg announced A$337 million in extra funding to tackle drug crime, specifically the drug supply chains of outlawed motorcycle gangs. A widespread inquiry into misconduct in the finance industry exposed a litany of wrongdoing by the nation’s banks, and has spurred the government to action. It will provide A$400 million to the Australian Securities & Investments Commission to boost supervision and encourage more court action against wrongdoers. The Australian Prudential Regulation Authority will get a A$152 million funding boost to better oversee issues such as governance and remuneration.